I thought it was about time that there was a permanent James Hunt based website. There are pages on F1 sites about him, but no real websites, which is a shame. James was World Motor Racing Champion in 1976, and part of this site will cover his season. I decided to make a site dedicated to James, because there are a lot of sites about Jim Clark and Niki Lauda etc, and very few for James! James was the big racing hero of the 70's, and made F1 popular with a lot of the public who hadn't known about F1 before in Britain, to the point where if James had not competed and won, we may not have had drivers like Nigel Mansell and Damon Hill to follow him. This site is purely about his racing, I will not talk about his private life, because it is no-one's business but his, and I think it's wrong to make judgements on him. he did what he did because he wanted to. OK, that sound preachy, but there you go, lol. James and Niki's infamous battle for the 1976 championship has been turned into a major Hollywood movie, directed by Ron Howard. It's called Rush, it stars Chris Hemsworth, famous for playing Thor as James and Daniel Bruhl as Niki. It's a great film and I totally recommend it! There are several models and books to look out for on James. Minichamps Models do a very nice Hunt McLaren in both 1/18th and 1/43rd scales, for about £20 and £50 respectively. James himself wrote a book called Against All Odds about his championship year, that you can probably find in second hand book shops. 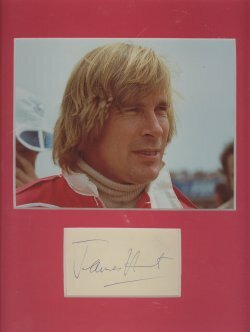 There is a very good biography on James, called James Hunt: The Biography, which you can find on amazon.co.uk. There is a video that James is interviewed by Nigel Roebuck called James Hunt: Champion, which was also released on DVD. Again go to amazon for this. James endorsed a set of Scalextric slot racing sets by Aurora, but these are EXTREMELY rare and expensive now. Finally Corgi made a toy of the Hesketh, that may be a bit hard to find, but well worth it for Hunt fans! For more M23, and a feature on James try the August 2002 issue of Motorsport magazine, and there was very good article on the 76 season in the February 2001 issue. Again try back orders for these. The Real James Hunt show on Channel 4 was repeated last night. For those of you who haven't seen it yet, don't worry, because it's not a great show, and tries to show James in a bad light. There is a better show in the Clash of the Titans sporting series that BBC showed a few years ago. Recently, BBC showed a documentary called Hunt vs Lauda, which is available on DVD. There are various DVDs that Duke, who specialise in racing films and documentaries have made as well.